Earth Day is right around the corner, and with Easter just behind us, I’ve got a stock-pile of egg cartons just begging for repurposing. I had the opportunity to share my favorite ideas with Parents.com, showcasing eight fun and simple ways to transform those egg cartons into something really special. Earth Day is all about celebrating nature and remembering to appreciate the Earth by reusing, repurposing, and recycling. These egg cup activities do all that – and more! 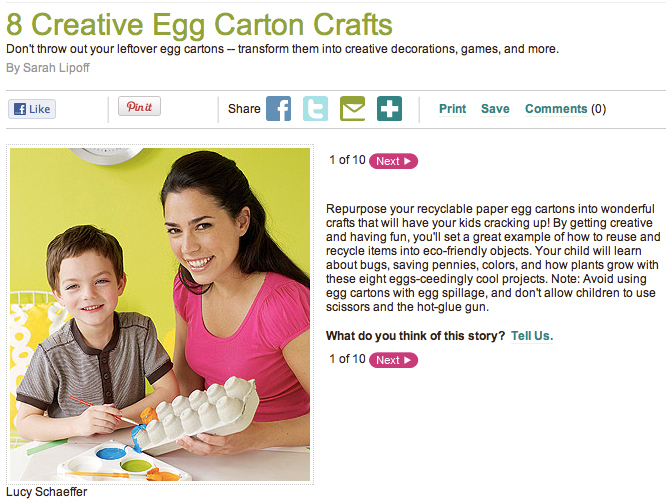 So head on over to Parents.com to check out 8 Creative Egg Carton Crafts and get busy with your kiddies! Want more egg carton inspiration? Check out my adorable egg cup mask that the tot and I put together along with these other awesome egg carton activities. Everyone is having fun with egg cartons!